Product code: 288 Categories: Sold Items, Sold Watches. This is a very stylish watch. 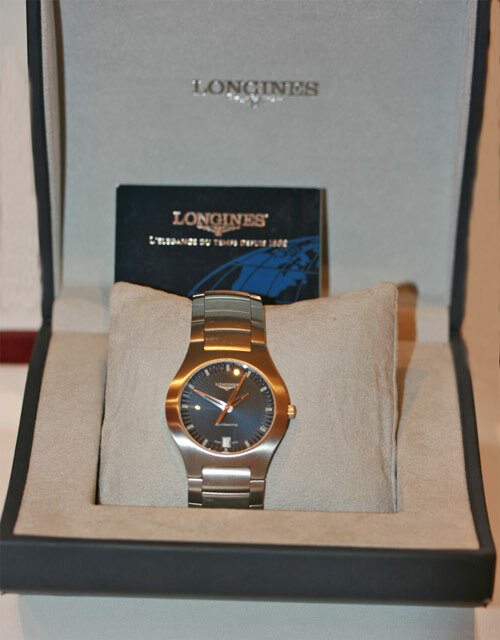 Made by Longines in stainless steel, the band wraps beautifully around the wrist. With an exhibition window in the reverse showing the 21 jewelled automatic movement, and the lovely dial with the date, it is so nice to wear. The sapphire crystal makes the glass scratch proof, showing the lovely blue dial, and coming complete with all of its box and papers, this is a great gift for someone, or for yourself!